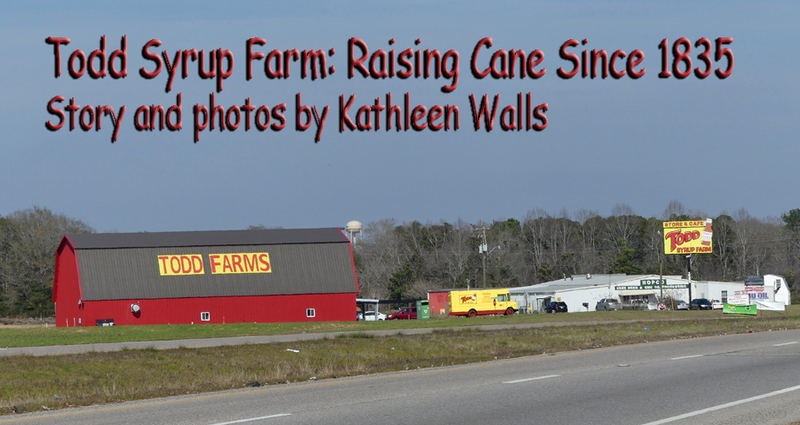 Can you imagine one family raising cane since 1835? Well, that's just what Joe Todd's family has been doing. The cane they have been raising isn't the kind that gets you in trouble. It's the kind that sweetens your pancakes and biscuits. Through good times, bad times, multiple wars and a depression, the Todd family raised cane. They also ground it and made delicious syrup from it. Joe Todd, now in his 80s, along with his children and grandchildren are still making mouthwatering cane syrups. A visit to Todd Syrup Farm is more than a way to taste the syrups. 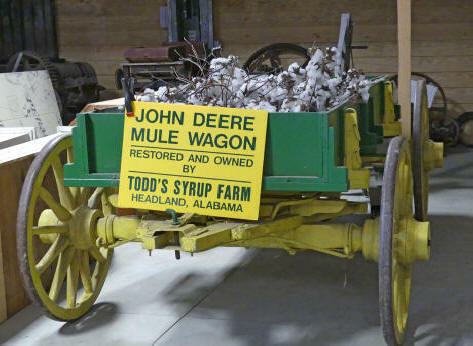 It is a trip back in time with the museum Joe Todd had assembled there. 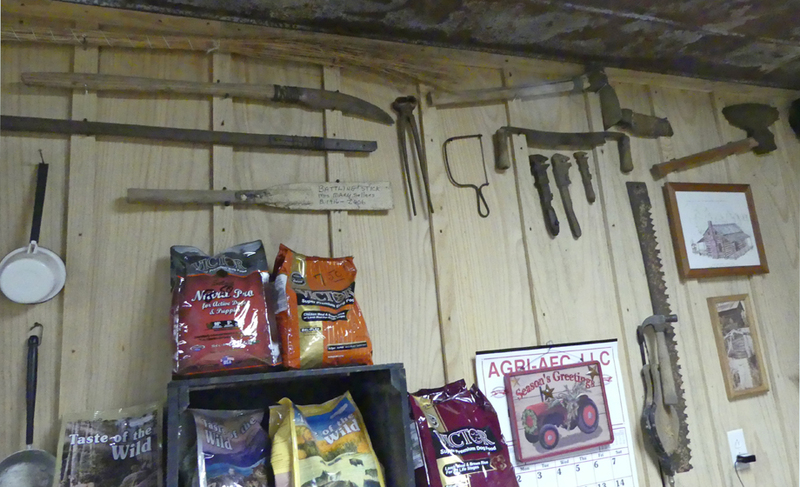 There are over 1000 implements dating back to the 1700s related to cane growing and syrup making. Many are family treasures like the cane stripper hanging in his office. He pointed to a simple but obviously old instrument hanging on his wall and told me, "This is my granddaddy's cane stripper that his granddaddy made for him." He went on to tell about how in 1864, his great-great grandfather, Eli Todd, walked home from the Civil War Battle of Atlanta and began making cane syrup in Alabama, just a short distance from where Todd Syrup Farm is now located in Headland, Alabama. Joe proudly displays Eli Todd's picture hanging on the wall along with earlier and later Todds. He can trace his ancestry to Francis Marion, the famed "Swamp Fox" of Revolutionary War fame. Joe Todd is still making organic cane syrup much as his family did generations ago. He is still grinding his cane with a grinder dating back to the 1920s. 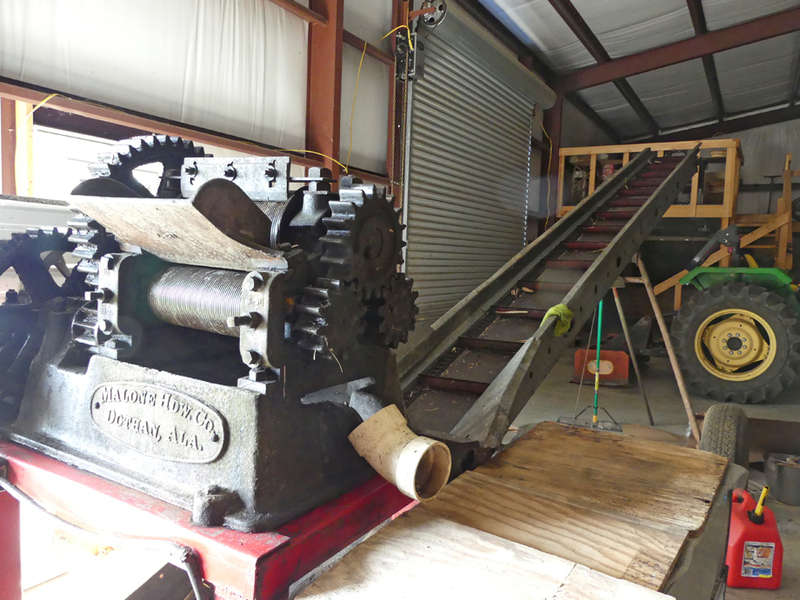 He does still have an 1853 cane mill he operates when school kids come to visit. One innovation he has made is that he uses a motor driven grinder now not one powered by a mule but the mules still have a presence at Todd Syrup Farm. 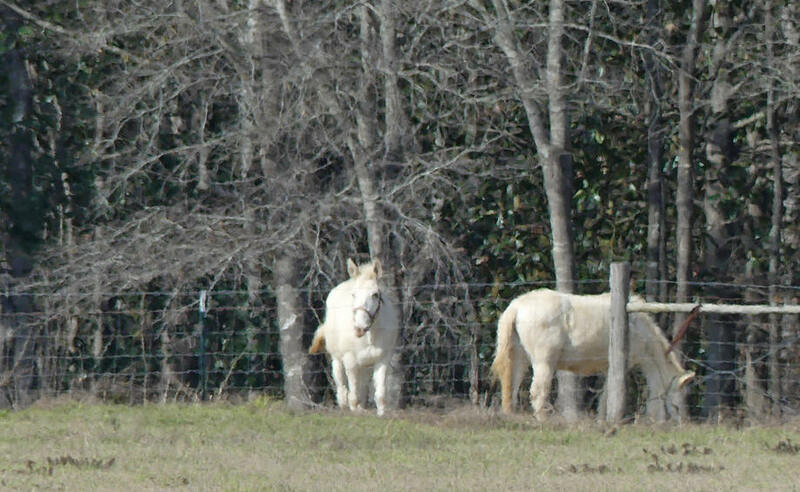 You can visit his white mules in a corral to the back of the field. There is a history about the mules. After the revolution, the King of Spain visited the United States and gifted George Washington with a white mule. Washington saw the value of mules and began breeding them. Since they are a cross between a horse and a donkey, they are sterile. It is easy to see Joe is fond of his mules. He stated, "Mules made this country, a mule and the sweat off a man's back. All this land was cleared with a mule." Joe is a perfectionist which he credits to his mother's teaching. "She was a perfectionist." He can give you details of grinding and cooking the cane into syrup that few people today know. She also believed everyone should know how to can and preserve. The result of that is a line of canned sauces, salsa, pickles, relishes and preserves made onsite and available I the farm shop. 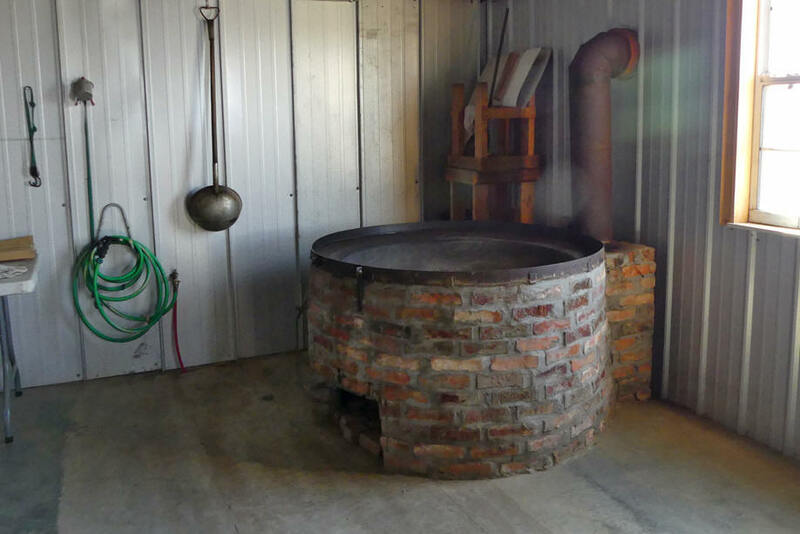 The cane cooking areas is simple but clean and efficient. When he led us out into the barn and showed off his collection. 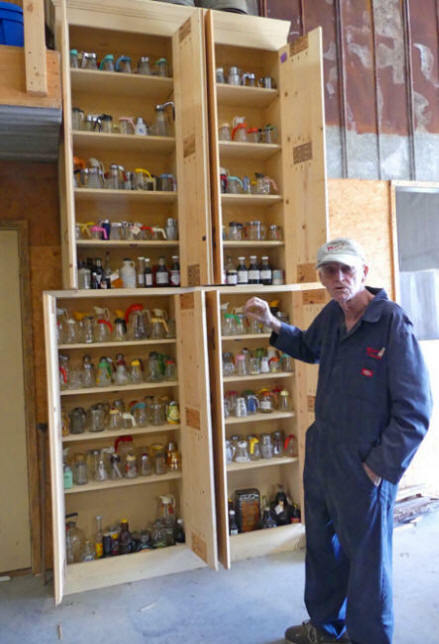 He is proud of his collection of over 300 cane pitchers, the largest in the world. 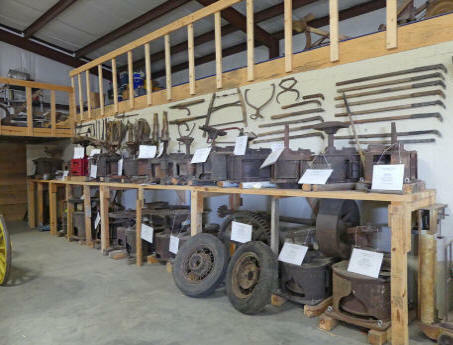 He has the remnants of the first Todd mule pulled plow from 1770. 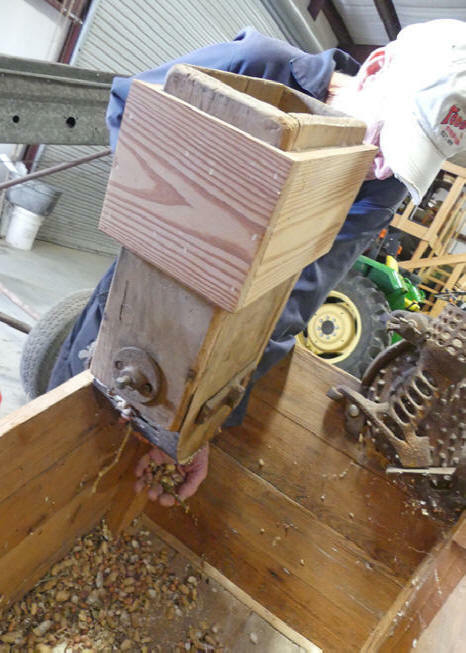 One unique instrument is an early peanut sheller. There are a multitude of mule driven cane mills. 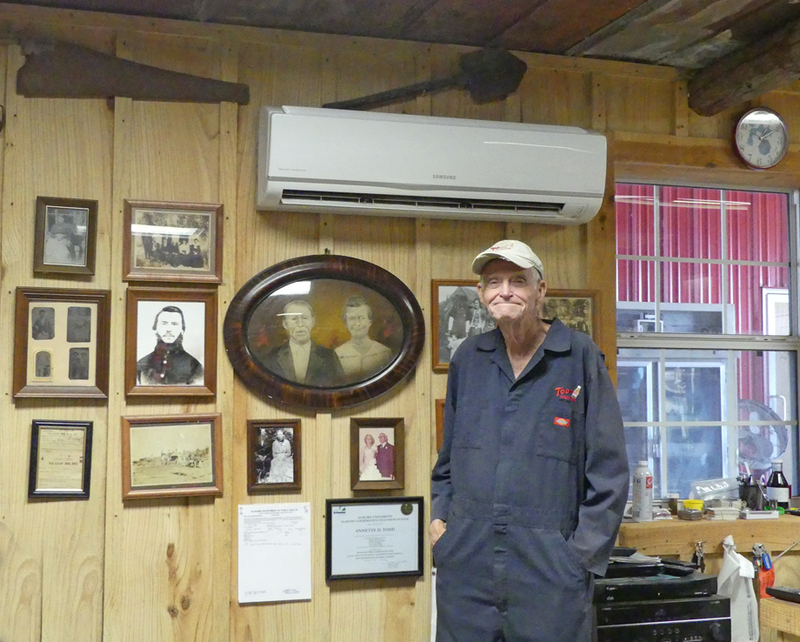 He has the last cane mill was built in America in December 1941. 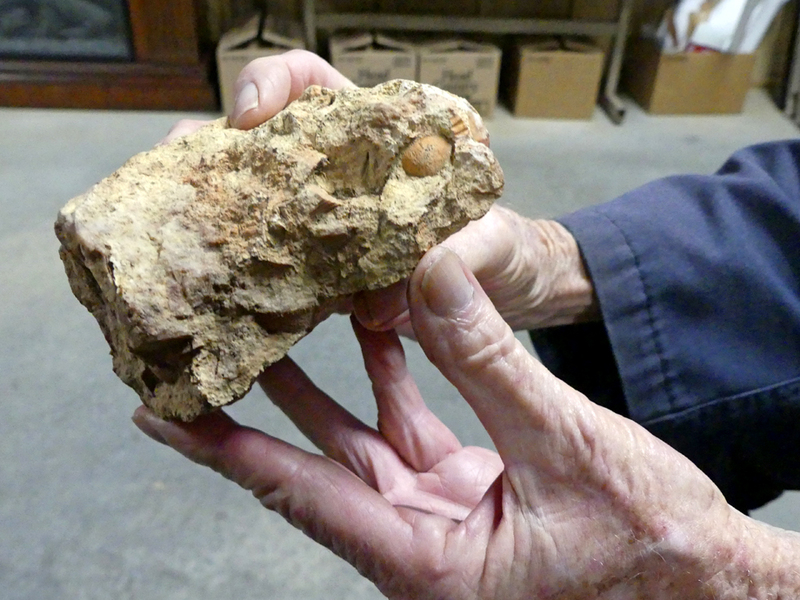 Not only does he have a fantastic collection of instruments but he had many rocks containing sea shell fossils. He explained, "This land was once the Gulf of Mexico." He also has many arrowheads and spear points from the Creek Indians who once claimed this land. Joe Todd credits the success of his farm today to what he received from his ancestors. As he said, "When the first Todd landed in Alabama from Scotland, there were no houses, no telephones. All he had was the clothes on his back and he survived." He not only can look back to his family history but forward to new innovations for his business. Todd Syru0p Farm now has a 58-seat restaurant that serves many of Todd Farm products. He has added a orchard, a pavilion, pick-it-yourself options and a food truck. Todd Farm has been named "Farm of Distinction-Winner at Large" by Alabama Farm-City Committee. The competition recognizes farms of all types and sizes for excellence in production, management, stewardship and innovation. However, Joe is not reassting on his ;laurels. He shared a secret, "We have a RV park coming in within months with WiFi cable and all the amenities." A visit to Todd Syrup Farm reflects the best of both worlds, a rosy future ahead based on a historic past.